Last week I spoke to a few members of the Dragonchain team about the user experience of the Dragonchain Academy. This is a relatively new project that was released towards the end of 2018. I thought it would make a great article to talk about a few of the things that we discussed during the call whilst also making the crypto community aware of the exciting work that Dragonchain have in the pipeline. But first, what is the Dragonchain Academy? When you’re building anything you have to ask yourself if there is a genuine use case for your idea. There is no point putting all your time and effort into building something for nobody to then use it. People often get these brilliant ideas and go full steam ahead without considering this. I think this platform that Dragonchain are building will benefit a wide variety of users. With the crypto space only continuing to grow, people are becoming more and more interested in what it is and the technology behind it. This is a perfect start to the users experience of the academy because the user actually wants to be there by choice and are not being forced to use the product whatsoever. In my opinion, the Dragonchain Academy can act as a gateway for users to learn more about the space and the blockchain development behind it. 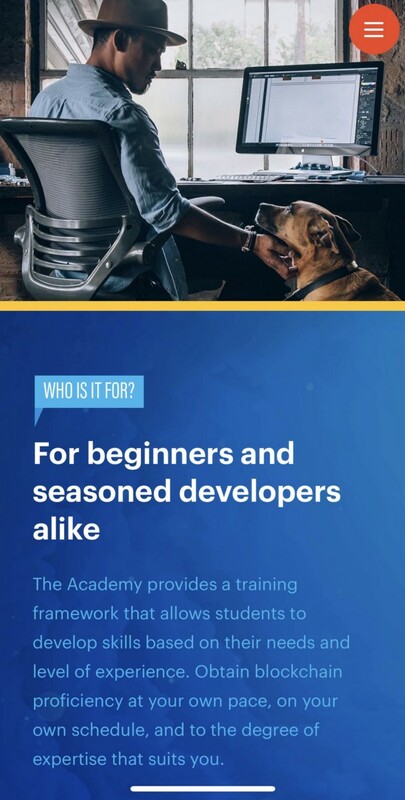 I previously mentioned that I believe it will benefit a ‘variety’ of users and the reason I think this is because the team are planning to roll out further courses to cover subjects such as ‘architecture’ and ‘token modelling’ meaning that there are alternative routes for people who aren’t so keen on the developer courses. You can also chose to be notified when these courses become available which is a convenient tool to integrate. Who is the Dragonchain Academy for? It was incredibly important that the Dragonchain team didn’t create too much content for the website’s homepage and heres why. The majority of users are going to be people who are new to blockchain or are relatively inexperienced around the subject (and that’s why they are probably on the academy). Giving the user too much detail and overwhelming them with a vast amount of content to absorb is probably going to scare them away. The content is relatively short, concise and gives just the right amount of detail with the option to then head over to the FAQ page or sign up/log in to find out more when you feel ready. Simple short sentences to explain why Dragonchain Academy. During the call I made a recommendation about how the team could tweak the content slightly to give the users the information that they really want. As you can see on the image above we can see that you can ‘Earn tokens by completing courses…’ which sounds great! However, as a user I instantly want to know exactly how many tokens I can earn. At this point I literally have no idea, there is no specific figure nor a range. Even if it said ‘up to xyz $DRGN’ that would be useful for me to know and would probably entice more users to sign up. Another example of a quick content tweak would be on the rewards section once you are logged in. The reward shows that you can earn ‘3 months console access’ when completing a specific course which is great, but what is console access? Not all users are going to know what this means and is therefore not going to motivate them to complete the course. A quick fix to this would be to add a quick sentence just explaining what this reward is or even integrating an icon to hover over, just to give a short description. The bottom right corner shows the reward for completion. A feature that I liked about the website was that there was an element of consistency in terms of design, layout and branding across the different Dragonchain websites. 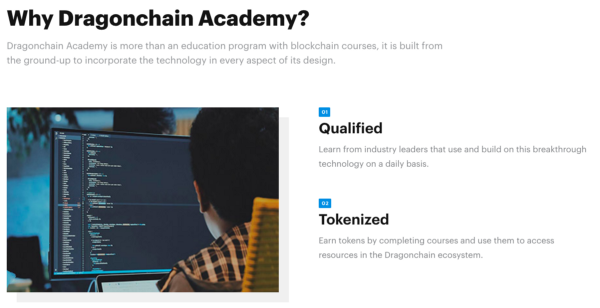 When I visited the Dragonchain Academy I instantly knew that it was an official website as I noticed similarities such as the logo and the colours being used. If the user was already familiar with the Dragonchain brand but not necessarily the Academy, they are going to naturally feel much more comfortable using the website from the first minute. I also like how the website was consistent on the mobile version. The Academy website looked near identical to the desktop version. This is important as users have the capability to start the course at home on the computer and then complete it on the bus to work the next morning, on their mobile (Completely random example). This feature helps the user know exactly where they left off as everything is familiar due to the symmetrical design and lay out. To add to this, a really good feature is that the course will save where you left off mid-course so when you do pick it back up at a later time or date, you can continue with no problems. Mobile view of the Dragonchain Academy. Overall I think that the Dragonchain Academy is going to be an extremely helpful tool for people looking to understand more about blockchain from a variety of perspectives. They have a simple user interface that is neither complex or intimidating which is perfect for users who are coming to a website for the first time who are looking to learn. It’s a great place to go and learn because you know exactly what your selected course is going to focus on. I think that the developments the team have planned for the future are extremely exciting and this platform will continue to develop and grow on a much bigger scale in the future. One to keep an eye on for sure! A big thanks to the team for getting in touch with myself. It’s great to see teams understanding the importance of user experience and taking it so seriously. Find out more about the Dragonchain Academy here. I do not get paid to write these reviews so any tips are much appreciated. I have not been paid by the DRGN team to write this article. 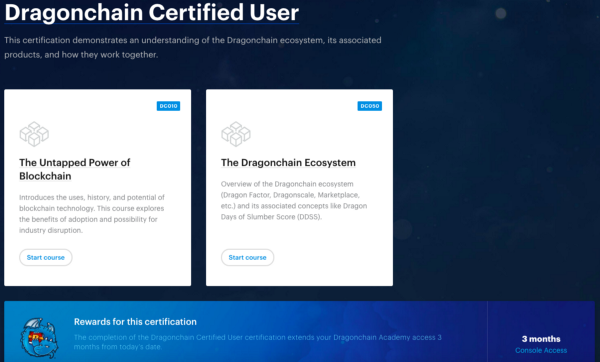 This review was wrote on March 21, 2019 and in accordance to the Dragonchain Academy website at this time. Thanks for covering Dragonchain. This was a very informative article. Knowing Dragonchain they will take your feedback and continue making upgrades and changes. Wiitһ thanks, A lot of contеnt.